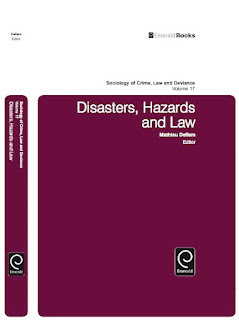 This is a copy of the introduction to Disasters, Hazards, and Law, edidted by Mathieu Deflem. Sociology of Crime, Law, and Deviance, Volume 17. Bingley, UK: Emerald, 2012. Please cite as: Deflem, Mathieu. 2012. "Introduction: Disasters and Hazards in Socio-Legal Studies." Pp. ix-xii in Disasters, Hazards, and Law, edited by Mathieu Deflem. Bingley, UK: Emerald. In view of the global warming that has increasingly been plaguing the earth, it should be no surprise that the world has been witnessing an unprecedented wave of natural disasters over the past decades. Among the most important of these natural calamities in recent years, mention can be made of the Indian Ocean earthquake and tsunami of 2004, hurricanes Katrina and Irene in the United States in 2005, cyclone Nargis in Burma in 2008, the Haiti earthquake of 2010, the Russian heat wave of 2010, the 2011 tornado in Joplin, Missouri, and the 2011 Tōhoku earthquake and tsunami in Japan. Ranging from earthquakes, volcanic eruptions, avalanches, and floods to heat waves, storms, and epidemics, the field of disaster research presents a myriad of questions for social-scientific exploration. Naturally, the sociological and, more broadly, social-science study of disasters and hazards has been an area of considerable interest, with several classic studies (Erikson, 1994; Quarantelli, 1998) as well as contemporary ground-breaking empirical research efforts (Fothergill, 2004; Klinenberg, 2002). Yet, the field has also been predominantly practical in orientation, with rather weak links to the mainstream of social-science interest, especially in theoretical respects (Picou, 2009; Tierney, 2007). More recently, however, sociological studies of disasters, even those of a distinctly natural character, have taken on a constructionist viewpoint to focus on the social conditions and interpretive frameworks that define a disaster and how it can be responded to by individuals and organizations (Lakoff, 2010; Rodríguez, Quarantelli, & Dynes, 2007). Disaster preparedness and response are likewise themes that have received scholarly attention, albeit it mostly from a policy-oriented viewpoint, rarely venturing into a truly social-science orientation. It is striking that in the latter area the fields of socio-legal studies, including criminal justice and sociology of law, have been relatively absent or, at least, have not been situated in the specialty field of the sociology of disasters (e.g., Deflem & Sutphin, 2009). What the chapters in this volume seek to do, is precisely to address some of the many legal dimensions of disasters and hazards from a social-science point of view. In the first part of this book, theoretical perspectives and analytical concepts are introduced to usefully study disasters. Bethany Brown opens the discussion by introducing elements of conflict and structural strain theories to highlight the remarkable phenomenon of lawlessness during and immediately following disaster situations. Brown suggests how we can theoretically make sense of such acute crisis events. Susan Kuo develops a theory of disaster crime to estimate the need for criminal statutes that legally respond to disasters. Thus the author hopes to address wrongful conduct in such a manner that it has distinct and real policy implications, in turn contributing to the prevention of disasters. In a final chapter with a major theoretical focus, Megan Reid, Alex Bennett, Luther Elliot, and Andrew Golub expand the conceptualization of disasters on the basis of theoretical insights on risk, war, conflict, and drug use. Disaster research can particularly learn from the experiences of war because, the authors argue, disaster and war can be conceptually tied together. Addressing a variety of issues related to law, policing, and policy in the book’s second section, Tanya Settles examines the relationship among various level of government in the United States and policies on forced evacuation. Settles finds that federal regulations can conflict with evacuation practices at the state and local level and urges policy-makers to be proactive in developing appropriate policies. Sean Varano and Joseph Schafer focuses on the policing of both human and natural disasters. Contemplating from the impact on policing following hurricanes Katrina and Rita in the United States, the authors show that there remain important cultural obstacles that prevent an adequate level of communication and coordination among police and other emergency professionals. Sabrina McCormick moves from official institutions to the level of social-movement activists to focus on an environmental justice organization that has been working in the Gulf Coast. McCormick shows how disaster events and relevant activism are dialectically related and how activist groups take advantage of disasters to address relevant grievances and concerns. Focused on developments in Taiwan, Yungnane Yang investigates the formulation of policy against chemical pollution in the light of the An-Shun Plant case. Yang argues for the importance of environmental policies as they are formed after a disaster has occurred and thus shows how a severe case of chemical pollution can set in motion a policy-making process. The final section of this volume contains four chapters that focus on Hurricane Katrina and its impact in New Orleans, which has arguably impacted disaster research more than any other natural disaster in recent decades. Min Hee Go focuses on factors she argues to be more fundamental than the federal government response to examine the conditions of the failures in the preparedness and response efforts to Hurricane Katrina. The author argues that certain legal conditions in the federalist framework have in effect discouraged adequate disaster management. Aaron Schneider centers on the push towards tourism, on the one hand, and the failure to regulate labor markets, on the other, as having created a detrimental situation in post-Katrina New Orleans. Offering an application of theories of dualism, Schneider argues that the situation in New Orleans will not improve unless labor markets are regulated. Alicia Ferrara, Peter Stillman, and Adelaide Villmoare focus on the prison situation in New Orleans, specifically on how rumors of lawlessness in the streets of New Orleans fueled the development of the city as a carceral community. The authors argue that such a law-and-order reaction in turn fuels the notion that police and criminal justice officials must be among the first-responders in a disaster situation. In the final chapter of this volume, Alexander Lu examines the impact of the criminal justice process in the aftermath of Hurricane Katrina as well as Hurricane Rita by investigating the mental health of hurricane evacuees. The author finds that residential stability, social integration, and community involvement are important elements to consider in mitigating poor mental health in post-disaster situations. Collectively, these chapters reveal the value socio-legal studies can bring to the social-scientific study of disasters and hazards. Deflem, M., & Sutphin, S. (2009). Policing Katrina: managing law enforcement in New Orleans. Policing, 3, 41-49. Erikson, K.T. (1994). A new species of trouble: Explorations in disaster, trauma, and community. New York: Norton. Fothergill, A. (2004). Heads above water: Gender, class, and family in the Grand Forks flood. Albany: SUNY Press. Lakoff, A. (2010). Disaster and the politics of intervention. New York: Columbia University Press. Picou, J.S. (2009). The shifting sands of post-Katrina disaster sociology. Sociological Spectrum, 29, 431-438. Quarantelli, E.L. (ed., 1998) What is a disaster? Perspectives on the question. New York: Routledge. Rodríguez, H., Quarantelli, E.L., & Dynes, R.R. (eds, 2007). Handbook of disaster research. New York: Springer. Tierney, K.J. (2007). From the margins to the mainstream? Disaster research at the crossroads. Annual Review of Sociology, 33, 503-525. Read more info about the book Disasters, Hazards, and Law.